Chef Emily will cook lunch or dinner in the comfort of your villa. Setting the table, serving and clearing up at the end is all taken care of! Based in the heart of Tuscany, Chef Emily has been living in Tuscany for the past 10 years learning about the area and the local food and wine. 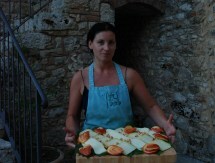 She enjoys sharing her passion and knowledge with those who come to explore Tuscany. Small celebrations!! Informal lunches or dinners served on platters 'family style'. While away the morning or afternoon in your villa learning how to make tasty local Tuscan and Italian dishes. 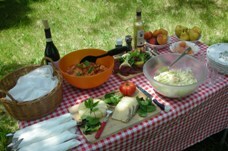 Chef Emily will guide you through making a delicious lunch or dinner which you will sit down to and enjoy at the end.